Q . Where did Viola’s name come from? Both of my grandmothers were called Viola! They were also hard working, inspirational women who were gifted with stitches. Neither lived to see Viola become a successful business, but I like to think that they approve of the choice of name. Q . Your shop is empty. How can I buy your yarn? My yarn is available through shop updates. I update the shop as often as I possibly can, but due to high demand (thank you) the shop does sit empty from time to time. To be informed of shop updates, I recommend that you sign up for my email newsletter. You can do so by scrolling down to the bottom of this page and submitting your information. If you do not receive a confirmation, please let us know by sending an email to hello@violaandthemoon.com. I send out a newsletter about one week in advance of all shop updates which will include the date, time and yarns that will appear in the update. All the essentials you need to plan your shopping! Q . How do shop updates work anyway? Good Question! Because Viola yarn often sells out quickly, there can be a rush in the first minutes after an update goes live. We send off an email newsletter approximately one week before each update, announcing the date and time that new yarn will be added to the shop. The newsletter will also include a list of the yarns that will be available as well as some colour previews. Leading up to the update, we will share more yarn previews on Instagram (@violaemily) and our blog. We do not provide a list of every yarn and colour that will be in the update. It is recommended that you are ready at the specified time, especially if there is something specific you’re after. No yarn will appear in the shop until exactly the specified time (bearing in mind that our website’s clock may be a few seconds, or more, off of your own). If you would like to be informed of shop updates, please sign up for our newsletter. You will find the form at the bottom of this page. Q . Can I visit you in Mooresburg to collect my yarn or shop in person? I’m sorry, but no. I seriously enjoy meeting you, helping you shop for yarns and having a chat, but ask that you do not pop in. In addition to being a very busy workplace (usually buzzing 7 days a week), the old general store in Mooresburg is also my family home. More often than not it is in a state of disarray, wet yarn strewn about and at least one person rushing back and forth between the dye studio and office. As much as I’d love to stop work and visit, there is much to be done and we keep a pretty tight schedule. At any given time, the yarn that we’re working is already destined for somewhere or someone, which has disappointed quite a few surprise visitors in the past. Because we are rarely able to produce enough yarn to meet demand, it also feels unfair to give certain people an advantage over others. I prefer to save up for shop updates and provide an equal chance to everyone. We live and work in an old general store, but it isn’t a store anymore. Sorry for the confusion! There is a bright side to this answer, because in July we will be opening our doors to the public! This old general store will become a store once again, but just for the day. I’ll tidy up my mess in the dye studio, bake some cake, put on a pot of tea and stock the shelves with yarn. We will be announcing the next Open Day date soon! Q . Do you combine multiple orders? Yes we do! Feel free to check out as many times as you would like. We will automatically combine all multiple orders placed within 24 hours and ship together in one parcel. No need to contact us. After all of the parcels have been taken to the post office, Brittany calculates shipping refunds and sends them off to you. Shipping refunds are not sent automatically, so please bear with us as the math happens. Q . I received a shipping notification, so where is my shipping refund? Each shipping refund is calculated individually and this is not an automated process (see above for more detail). It takes a little bit of time and we like to double check our results. Expect your shipping refund to be sent up to one week after you receive a shipping notification. Q . It’s been longer than I expected. Can you help me track down my parcel? Unfortunately, if you did not choose the tracked option at checkout, we have no way of helping you track down your parcel. It is very, very rare to see a package disappear entirely, so keep up hope! 2-3 week waits for some international destinations are not uncommon, and we have even seen a parcel take 4 weeks (but that was crazy!) The only way you can ensure your parcel arrives safely is to choose the tracked option at checkout. Canadian parcels are always tracked, so worry not Canadians! Q . Do you take custom orders? No we do not. Due to the high volume of requests coming in, and Viola’s labour intensive dyeing process, we simply cannot commit to custom orders. Thank you for your requests and for wanting to use Viola yarn. The time saved on custom orders is used to create new colourways and offer larger shop updates, so it’s not all bad. Q . Do you wholesale? Sadly, no. This was a difficult decision because I truly appreciate the importance of the LYS and the excitement of shopping for yarn in person! However, Viola’s time consuming dyeing methods make it very difficult to produce the quantities needed to sustain wholesale relationships. Freeing up creative and mental energy allows for larger, more frequent shop updates and more involved colours. It is also the most effective way to offer yarn to knitters around the world. This may not be a perfect scenario, but it works out to be the most fair to you and to us. Q . Why do your colourways look so different from batch to batch? It may be an unusual approach to dyeing, but Viola colourways are not measured formulas. They begin with a ¼ teaspoon of this and that, but the colour evolves in the dye pot by instinct and intuition. While the scientific approach is much more reliable, I prefer to approach each batch of yarn as a composition of colour. It can be affected my the season and the other colours I’ve dyed that week. Each time you pick up a skein of Viola yarn it has been carefully considered and is a new interpretation of the original colourway. For this reason, it is strongly advised that you purchase all the yarn you need for a project at the same time. Q . How long does it take to dye a skein of yarn? I mention Viola’s labour intensive dyeing process quite a lot, but have never gone into any detail about it. Without giving away the trade secrets, I can say that mixing a dyestock is just the beginning of a long and meandering journey of colour contemplation. 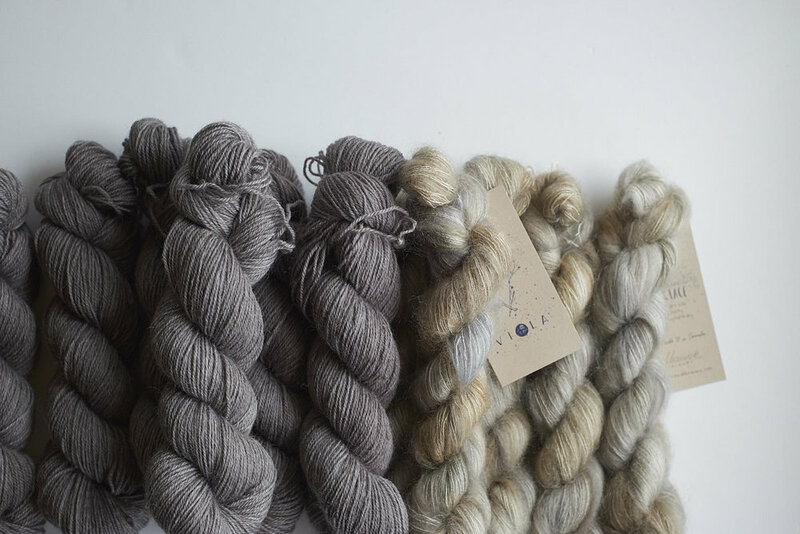 Through a process of turning the skeins over, inspecting, adjusting and adding colour, each batch of yarn takes around 5 hours of time in the dyepots. 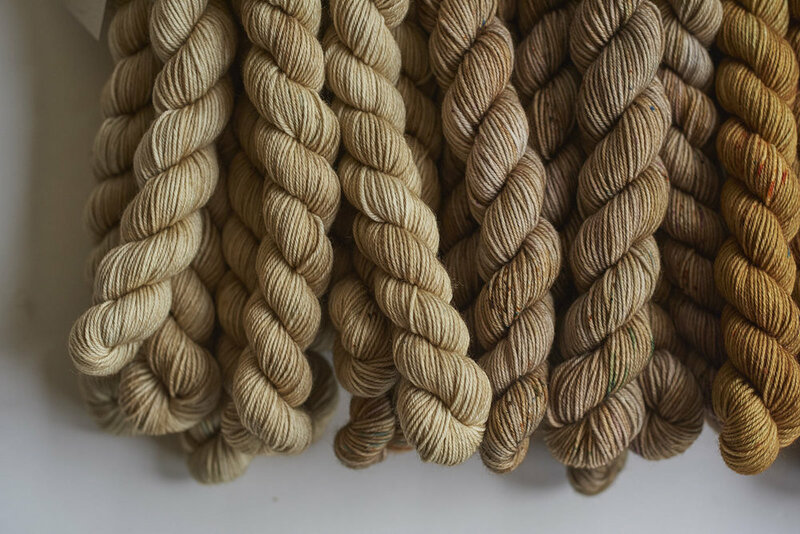 To give you a little perspective, each of our 4 dyepots holds ten 100g skeins of yarn. At any given time, at least two of our four dyepots are broken (separate story, but also a factor) which means that we produce about 20 skeins of yarn every 5 hours. That is solely dyeing time and excludes planning, prepping, drying, skeining, labelling and packing.